An Arc Trainer is a great piece of stationary workout equipment that is pretty much a treadmill, elliptical machine, and stair climber all in one. If you have never used one before, you might just change your mind after you read what we have to say. There are many Arc Trainer benefits that you should take advantage of and you should start doing so right now. This thing will make you stronger, faster, more enduring, happier, and more mentally capable too, and that is no joke! What Is An Arc Trainer? 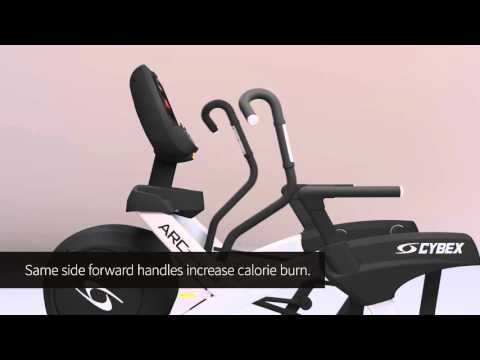 The Arc Trainer is a big stationary piece of exercise equipment. 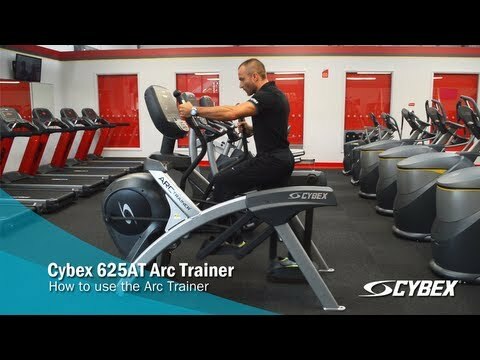 The Arc Trainer is actually a brand name and it was registered by Cybex International, INC. As opposed to an elliptical machine where the foot pedals move in an elliptical pattern, the pedals of the Arc Trainer move in an arcuate pattern. Interestingly enough, the Arc Trainer is only designed to generate force during the weight bearing cycle of your gait. This special design results in a high calorie burn with reduced stress on the ankle, knee, and hip joints. As you probably know, exercising inherently burns calories, and an aerobic exercise like Arc Training is very calorie intensive. Those calories are required by your body in order to function, especially during intense exercise. They are the fuel of your body. If you have an abundant supply of calories, or in other words, if you have eaten calorie rich foods, your body has more than enough fuel to exercise. The problem is that if you don’t exercise, those calories will turn into body fat. Well, using an Arc Trainer for just 30 minutes can result in you burning between 300 and 475 calories. This does of course depend on how intense you train at and how heavy you are, but in all reality, you can burn anywhere from 250 to 550 calories in a 30 minute period. Even better is that if your body is not full of food and calories, your body will turn to your fat reserves for fuel. This means that you are running on a calorie deficit. It takes a 3,500 calorie deficit to lose 1 pound. Therefore, if you Arc train for 30 minutes per day, you can lose more than a pound per week, possibly more. Also, in case you did not know, an Arc Trainer can help you burn up to 16% more calories than a treadmill or elliptical machine. There is even more to it than that as well. This kind of exercise also helps to rev up your metabolism big time. This means that your body burns more calories in order to fuel itself, more than it would without exercise and a hyped up metabolic rate. This does also not just count for while you are exercising either. After you are done Arc training, your EPOC or exercise post oxygen consumption will remain increased, which means that you continue to burn a greater number of calories long after you stop working out. 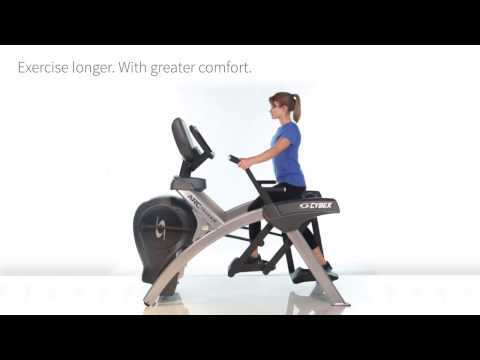 Arc Trainer® vs. Elliptical vs. AMT® - Cybex International, Inc. The next benefit that you get from using an Arc Trainer on a regular basis is that it helps strengthen many of your muscles. An Arc Trainer engages various muscles in your legs all at the same time. You can actually adjust an Arc Trainer to several different modes with differing stride lengths and patterns, each of which targets certain muscles and activates them in different ways. An Arc Trainer can help engage many more muscles in your legs that various other exercise machines, especially low impact ones like this one. The overall result of this is that everything from your calves to your glutes will feel the burn of an Arc Trainer workout routine, ultimately leading to bigger finely toned muscles throughout your legs. Moreover, Arc Trainers also feature handles that have a greater variation in distance and motion than something like a stair stepper or elliptical machine. Therefore, your arms, chest, and shoulders also get a pretty decent workout from an Arc Trainer. Also, you can even flex your abs while you sweat on the Arc Trainer, thus engaging your core muscles along with your arms and legs. When it comes to strengthening muscles and maximum muscle activation, the Arc Trainer is pretty much like a treadmill, elliptical trainer, and stair stepping machine in one. An Arc Trainer is a great aerobic workout that provides you with tons of cardiovascular benefits. To be clear, an aerobic exercise is one that requires a large amount of oxygen to maintain, and a cardiovascular workout is one that causes your heart to beat at well above its normal rate. Well, guess what, an Arc Trainer does both of those without question. We all know that cardiovascular exercise is important, but why exactly is that? For starters, training your heart to be more efficient at pumping blood around, which is what an Arc Trainer does, lowers your resting heart rate and your blood pressure. In essence, this means that your heart is not working as hard to do the same job, ultimately resulting in a heart that will last for many years to come due to decreased stress put on it on a daily basis. Moreover, cardio exercise also helps to control cholesterol, it reduces the chances of heart and arterial disease, and it reduces the chances of having a stroke or heart attack as well. There is also the fact that when your heart is more efficient at delivering blood throughout your body, your muscles get more of it, plus more oxygen too, and therefore they can end up going for much longer before you feel fatigued. An Arc Trainer is a great way to prolong your lifespan without a doubt. As we mentioned in the point before, an Arc Trainer counts as an aerobic exercise, which means that your lungs are being taxed just as much as your heart. This is because an aerobic exercise is any type of exercise that causes your lungs to work overtime due to an increased need for oxygen. Trust us when we say that 10 minutes on an Arc Trainer will definitely get your lungs heaving like no tomorrow. Once your lungs get going like that you get winded, you are short of breath, and pretty quickly it becomes impossible to keep going. Eventually, you would pass out from the lack of oxygen to your brain, and even before that, your muscles would start to burn and hurt thanks to oxygen depletion. This is all related to something called your VO2 Max, which is how much oxygen your lungs can absorb, process, and send throughout your body. Well, working out on an Arc Trainer taxes your lungs pretty heavily. Just like your muscles and your heart, the more you exercise your lungs, the better they will get at their job. They grow better at what they do just like all of the other parts of your body when they are exercised regularly that is. Eventually, over periods of exercising on an Arc Trainer, your VO2 max will increase, which means that your lungs can process more oxygen. This means that you will get winded less often and that you can work out for longer thanks to a more abundant oxygen supply. It’s actually quite the neat little cycle. Another thing that you are going to love about the Arc Trainer is that it will help build your bones to be bigger and stronger than ever. You see, the Arc Trainer has you up on your legs the whole time, and it has you moving them back and forth, thus applying extra weight and mass to your skeletal system. This is a type of exercise which is known as a weight bearing exercise, which is pretty self-explanatory as far as we are concerned. A weight bearing exercise, that being any exercise that puts increased weight on your bones is considered to be bone building in nature. The reason for this is because your osteoblasts, which are the cells in your bones that create new bone mass, are spurred on to lay down more bone cell whenever you engage in a weight bearing activity like Arc Training. This is more or less equivalent to strength training building muscle or aerobic training making your lungs more efficient. The more you engage in weight bearing exercises like Arc Training, the more bone mass your osteoblasts lay down, and ultimately that means building bigger, stronger, and denser bones. This comes in really handy for preventing fractured and broken bones when you slip and fall, plus it helps prevent degenerative bone diseases such as osteoporosis in your old age. Many of the previous points are actually related to this one. There are many things which help to contribute to your overall endurance, many of which benefit individually from the Arc Trainer. Together all of these other benefits lead to you have much better endurance and an increased ability to perform physical activity. First of all, with stronger muscles automatically comes increased endurance and ability. Stronger muscles help you run faster, jump higher, lift heavier loads, and do it all for much longer. Those muscles all require increased amounts of blood and oxygen to function at such intense levels. Well, the Arc Trainer increases the efficiency of your lungs, thus processing more than enough oxygen to keep exercising for long periods of time. So, now we have the oxygen for your muscles to function, and we also have the delivery system, the heart. We already mentioned that the Arc Trainer is a great cardiovascular exercise. That strong heart is the delivery system for that valuable oxygen to get to your strong muscles. There are many things that go into being able to perform physical activities for long periods of time, all of which benefit from the Arc Trainer. This thing really is a great all around workout machine that makes you stronger, faster, more capable, and more enduring. The next benefit that comes with using an Arc Trainer on a regular basis is that it will definitely challenge you in many different ways, plus there is the fact that it can offer different levels of challenge to people with different needs. First of all, there are 3 different main positions which you can adjust the Arc Trainer to, all of which test different muscles and work your body out in various ways. In case you did not know, it is really good to get some variation in your workout routine because your muscles get used to doing the same exercises over and over again. Therefore adding variations into the mix will keep your muscles on their toes, so to speak, and will make them more susceptible to fast growth. The Arc Trainer’s 3 main positions include the low stride, which is like cross country skiing, there is the middle stride, which is kind of like running on a slight slant, and then there is the high stride, which is like mountain climbing or a really steeply inclined elliptical. Keep in mind that this is just a rough approximation and comparison to other machines, but the fact of the matter remains the same and that fact is variation and versatility. Moreover, pretty much anybody can use the Arc Trainer. It is not gender exclusive, and as long as you are tall enough or physically able, you should have no problem using one. Remember, you can always start out low and slow, then work your way up the ladder. Literally anyone can use an Arc Trainer and that is definitely a big benefit. Yet another benefit that you get from using an Arc Trainer is that it will help strengthen your overall cognitive abilities. Physical exercise of the aerobic and cardiovascular type is shown to affect your brain in a certain way, and that is because of the increased stimulation, oxygen supply, and blood flow. All of this extra juice flowing to your brain results in increased neural activity, and moreover, it results in more neurons being produced by your brain. Your neurons are the things which send and receive signals, and they control everything from basic functions like breathing and balancing all the way to mental processes. There are several certain aspects of your brain function which are improved thanks to increased neurons and neural activity. Things like your ability to solve problems, your short and long term memory, and most of your other basic cognitive abilities are improved thanks to this. In fact, the effects of this are so great that it is even linked to preventing and controlling the symptoms of neurological diseases such as Alzheimer’s. Yet another aspect of your mental health that benefits from regular Arc Training is your level of happiness. Things like depression, anxiety, and high stress are shown to be caused by chemical imbalances in the brain as well as a lack of certain chemicals, the ones which stabilize your mood and make you feel happy. Well, you have probably heard of something called the runner’s high, which is when runners feel really happy, joyful, elated, and very relaxed. This is because aerobic cardiovascular exercise makes your brain produce more of the chemicals which make you feel happy. Chemicals such as serotonin, dopamine, and various endocannabinoids are produced when you exercise vigorously. Together they have the ability to lessen or even cure the effects of depression, relieve the feeling of anxiety, deal with stress, and they can even help reduce the amount of physical pain that you feel. The bottom line is that exercising on an Arc Trainer will provide for a happier and more mentally balanced you. Another great benefit of using an Arc Trainer that is definitely worth mentioning is that it is a low impact exercise. This means that there is no heavy impact or shock sent throughout your feet, legs, and the rest of your body when using the Arc Trainer. This is not like running or doing jumping jacks which are considered to be high impact exercises due to making you land on your feet after jumping or being elevated, something which of course sends a shockwave through you. This may not necessarily be a bad thing for people that still have healthy joints and bones, but it is not so good if you already have existing bone and joint issues. Some joint issues make it unwise and sometimes nearly impossible to perform high impact exercise, which is a problem because it results in a reduced ability to exercise. The Arc Trainer is great in this sense because your feet never leave the foot rests, and therefore there is no huge impact every time you land, mainly because you never have to land. The Arc Trainer is a great way to get your exercise in without damaging your joints any more than they already are. The final thing we want to mention is that the Arc Trainer can also help you control diabetes. Diabetes is your body’s inability to properly process glucose, something which can end up being very deadly in the long run. Exercising and using your muscles﻿﻿ help your body to process that unused glucose much better. This is because your muscles end up using some of that glucose to perform physical activity, and therefore there is less need for your body, mainly your liver and kidneys, to deal with the excess sugars. If you needed a little recap, the Arc Trainer makes you faster, stronger, it gives you an all in one workout, it makes you more enduring, smarter, happier, and so much more. The Arc Trainer benefits are vast and they each work in their own way to make you a healthier person! If you have any other questions about the Arc Trainer, just feel free to ask us and we will do our best to address you in a timely manner!